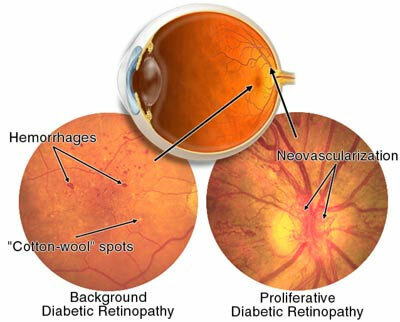 Diabetic retinopathy is treated in many ways depending on the stage of the disease and the specific problem that requires attention. The retinal surgeon relies on several tests to monitor the progression of the disease and to make decisions for the appropriate treatment. These include: ocular coherence tomography (OCT), fluorescein angiography, retinal photography, and ultrasound imaging of the eye. Since macular edema is the most common cause of vision loss in people with diabetes, it is important to minimize or eliminate macular edema when it occurs. The most common treatment involves injecting a VEGF inhibitor into the eye. Sometimes, a steroid injection may be utilized in addition to or in place of VEGF inhibitors. In certain cases, focal retinal photocoagulation is preferred which has been shown to decrease the rate of vision loss by 50%. The abnormal growth of tiny blood vessels and the associated complication of bleeding is one of the most common problems treated by vitreo-retinal surgeons. Laser surgery called pan retinal photocoagulation (PRP) is usually the treatment of choice for this problem. With PRP, the surgeon uses a laser to destroy oxygen-deprived retinal tissue outside of the patient’s central vision. While this creates blind spots in the peripheral vision, PRP prevents the continued growth of the fragile vessels and seals the leaking ones. The goal of the treatment is to arrest the progression of the disease.